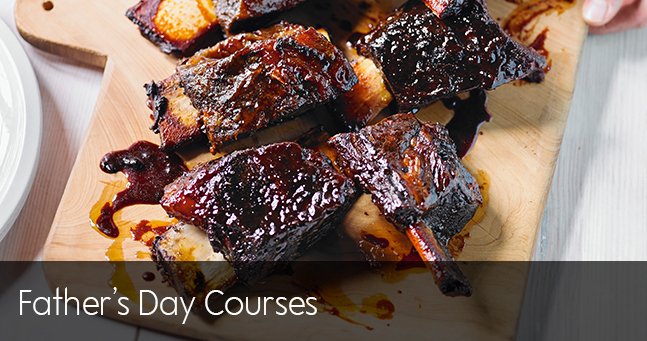 Treat your dad like a king on Father’s Day as you bond over cooking recipes paired with beers and cocktails. Our chefs will guide you through making chicken wings, cheese cornbread, Boston baked beans, chipotle and confit garlic slaw, red wine braised short ribs, plus a New York cheesecake. Now that’s a celebration! Or call 0207 372 6108 for more information. If you're looking for a different way to celebrate Father's Day this year then we have the course just for you. You'll not only get the chance to spend some quality time with your dad but at the same time cook up a storm. For this entirely hands on course we've chosen three recipes that you will prepare under the guidance of our chefs. You'll then sit down to your well deserved menu of puff pastry tarts piled with caramelised onions & cheese, herb-crusted beef fillet with forestiere potatoes and an indulgent chocolate and caramel swirl brownie to finish. Or call 01722 329 429 for more information.